Melbourne River Cruises is a cruise tour specialist based in Melbourne, who provides sightseeing river tours with some of the landmarks in Melbourne. The sightseeing tours goes to famous Melbourne landmarks such as Botanical Gardens, Melbourne Cricket Ground, and all the way to Williamstown. It also offers a cruising dinner experience on Yarra river. Although Melbourne River Cruises had a website, they had to take each and every booking manually entered and billed, which prompted them to want to revamp their website to a platform where they can accept payments, as well as bookings for sightseeing tours and dinner cruises. I decided to use WordPress as their platform due to my knowledge about developing in WordPress, and decided to develop a whole new theme based on the HTML5 Blank theme available, and supercharged with Bootstrap. As a result of a custom-developed theme, I also had to develop the integration with their payment gateway system. Originally, I had intended for the website to have a separate booking and payment form, as it would redirect traffic to a subdomain, and makes it easier to install a security certificate. However since the website has a quick booking functionality, where one can book a ticket from any page, I had to apply the certificate to the whole domain and making sure each and every resources and assets still works. 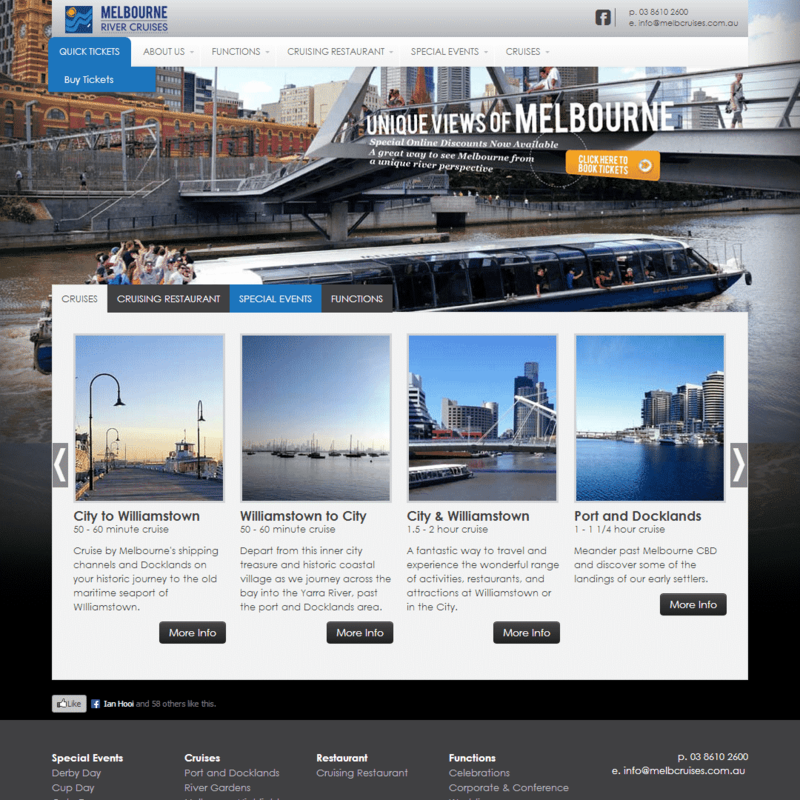 Melbourne River Cruises website was completed at the end of May 2013.